Original Picture generously contributed by Mille Belew, thanks Millie! 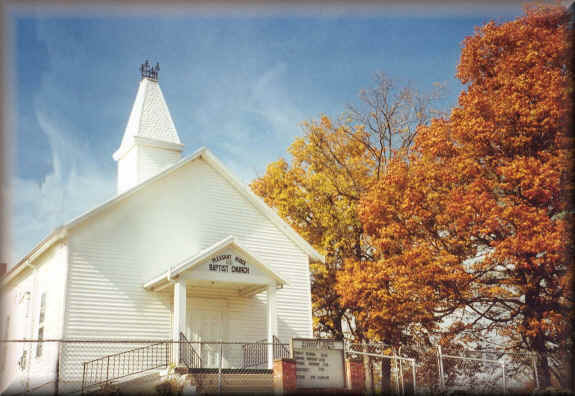 The first minutes always read "REGULAR BAPTIST CHURCH OF JESUS CHRIST" until 1955 when it was voted to change the name to Pleasant Ridge Baptist Church. The records of the church are incomplete, as the first records have been lost. There are two pages, believed to be from this first book, containing the minutes of the business meetings, dated from December 1867 to April 1868. In these pages they refer to recopying the old church book into a new book, then decided to retain the old book as it is and recopy the names of members and rules of decorum in the new book. This is found in the second book, of the meetings from November 1881-1899. The decorum or covenant states the church was constituted at Pleasant Ridge, Pendleton County, Kentucky on August 14, 1855. From a notation of Bro. S. C. Colcord, from the july 1926 issue of "The Witness", the monthly publication of the executive board of the Crittenden Baptist Association, published at Williamstown, Kentucky, J. W. Black Editor: He says 'The Church was constituted about 1854. Rev's Todd and Lee held revival service in the old log school house and near this time the church was organized.' He was then a boy of 13 years of age. He mentioned there were sixteen charter members, he being one of them and the only one living at the time. He named twelve others; Simeon Bush and wife; Kennedy Blackburn and wife; Benjamin Blackburn and wife; Jesse Stith and wife; Elrod Tewell and wife; William Lancaster and J. H. Colcord, Sr. He said two log buildings and the frame building now standing, have been built where the present church now stands and he being a member for 71 years, had helped build them all. He helped cut the first log for the second building, and helped build the foundation for the present one. He had also witnessed the ordination of every minister the church had ordained, ten in all, as follows; Bill Lancaster, who was a charter member and first pastor; Thomas Stephens; Rev. Hall (father of Moody Hall); George Grizzle; Allie Stith; Charles Mangold; Harry L. Thornton, Henry McKinley; G. C. Mullins and Ethel Simpson. Back to the minutes of the church; we have none from August 1855 to December 1867, where the two pages come in with the four meetings. Our first book has the back off and pages gone to page 31, with the first meeting recorded being July 1868. There is an old page with some names written on it, placed in the book, but not the church covenant. The first pages must have contained the covenant, members names and meeting dates for May 1868 and June 1868, and was destroyed as in this book it stated in September 1880, "on account of the church's list of names of the members being destroyed the church passed an order, by motion and seconded that each member shall enroll their name again, July 1881 or will stand as an excluded member." The next date of importance is 8th September 1865, an article of conveyance of Kennedy Blackburn, giving 1/2 acre of land and selling another 1/2 acre for $10.00 to the trustees of the Pleasant Ridge Baptist Church for the meeting house lot, ground lying on the Dry Ridge and DeMossville Road. A span of about 12 years, no minutes were found. March 1872, a proposition offered that this school district buy the meeting house, which was left for the consideration of the church, at their next meeting. May 1872, the proposition to buy the meeting house for a school house was dropped. October 1872 - Motion made and seconded that the church draw articles of subscription for the purpose of building a meeting house. Appointed were Elder Thomas Stephens and Bro. J. H. Gardner to draw up three or four articles of subscription for said meeting house. To be a frame house 30 x 40 feet. Payments to be made April 1873 and April 1874. Church appointed Elder Thomas Stephens, J. E. Tewell and Newton Belew to solicit subscriptions for said house. July 1874 - A motion was made to hold school in the church. Motion voted down. October 1874 - Motion to reconsider an act in regard to teaching a school in the meeting house. Motion carried and second. August 1875 - Agreed to have a called meeting, August 28th of the church and the school district, No. 31 in Pendleton County, Ky. for the purpose of taking into consideration the propriety of selling the church to the said school district, for school purposes and other business. September 1875 - Motion to sell the church to the school district No. 31, for a school house was taken up and carried with an amendment that a subscription be raised to build a new one and the money it brings be appropriated to the new building. Bro. William Oliver and Jesse Stith were appointed to committee to confer with said district to make the sale. Motion made for the committee to sell the church and report to the church, the 4th Saturday in September 1875. October 1875 - The report of the committee was read. Propositions called for and it was proposed to write a petition for a subscription to build a new church at the Pleasant Ridge Church grounds. J. H. Gardner was appointed to write a petition and J. A. Stith, T. F. Sanders and J. J. Plunkett to solicit subscriptions for the new church. October 1876 - Motion and seconded granting the privilege to L. H. Sanders to teach school in the church building for 5 months at $2.00 per month, amounting to $10.00 for the term. Motion to give our pastor Rev. Thomas Stephens $10.00 for his services. We really don't know about the first building or buildings, if there were two log buildings. We only have Bro. Colcord's written word on it. The books show they were getting ready to build a new meeting house in 1872 and was considering selling the meeting house to the school district for school and other things. But, in 1875 the subject was brought up again and the decision was made to sell and use the money in the new building to be built on the church grounds. The building was to be 32 x 50 feet. It wasn't until 1885 that their building was finished and in 1887 the building committee made their final report. Their debts were paid in full for the building. This building is the main part of the church building today. As the church grew, additions were made. In 1947 a basement was constructed for Sunday School rooms. In 1951 an addition was made to both the back and front of the building, adding more Sunday School rooms, a choir loft and baptistry. The bell in the belfry was purchased in 1889 and is still rung each Sunday morning. When the church was just five years old, it was a charter member of the Crittenden Baptist Association. 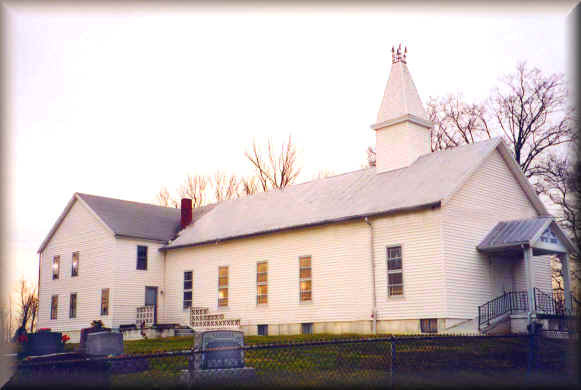 The delegates from the church were: B. Blackburn, J. Stith and William Lancaster, when they met with six other churches at Crittenden on August 12, 1860 to organize the association. The church has always taken an active part in all its activities. The social situations can change, but the Word of God does not. In their day the church used discipline when they felt an immoral act of some one in their fellowship would defile the church. It was done in the spirit of love and compassion, to bring the offender back into their fellowship. Our records show many changes such as neglect of attendance, quarreling or hard feelings toward another, drinking, dancing, swearing, selling liquor too close to the church, and trading horses on Sunday, are just a few. When a member's name was brought before the church, they had prayer for the person and appointed a committee of two or three to go talk to the person and ask him to come back to church and make a confession or amends. Then he would be restored. If not, then he would be excluded from the fellowship of the church. In 1876 they empowered the Deacons to take up offerings at Sunday morning meetings. The collections sometimes were less than $1.00. Their ways of meeting their expenses was by having committees solicit the money for the pastor, housekeeping, missions and when in need of fuel, supplies and repairs for the church. They let the housekeeping out to the lowest bidder in the early days. They furnished all the necessities except fuel. Later there were bills turned in for oil, lamps, lamp chimneys, stove pipes and etc. They were required to have water in the house and see that the church doors were open when need be. The housekeeper was elected each year at the same time they elected a pastor for the coming year. Deacons were first mentioned in 1876, when they were wanting to elect more deacons. We are sure they existed from the beginning, but there is no record of who they were. They set a day each year to meet for the purpose of cleaning the church and graveyard, as the graveyard was taken care of by the church. It was enlarged at various times and fenced. The old iron fence was built across the front in 1911 by W. R. Oliver. It was replaced in 1966 with the one there now. In the year 1971, the cemetery was placed in perpetual care. The parking space has been enlarged twice. They helped start the Knoxville, Mt. Moriah(?) and DeMossville churches. The church held its centennial celebration on August 14, 1955. Many former pastors and members returned for the occasion. The church has ordained 12 into the ministry and also licensed three to preach. It is debatable whether Bro. William Lancaster or Bro. Thomas Stephens or perhaps both were the first pastor. Those who have been ordained were: William Lancaster, James W. Hall in 1876; George W. Grizzell in 1887; Allie Stith in 1903; Charles Mangold in 1908; Harry L. Thornton in 1910; Henry E. McKinley in 1912; Gabriel C. Mullins in 1914; Ethel Simpson in 1926; Harold Earls in 1949; Clyde E. Bowen in 1951; Ronald Angell in 1975; and Bennie Turner in 1975. Those who have been licensed to preach are: Chester Bowen in 1952; Charles Howe; Phillip Turner Jr.; Charlie Walters and Danny Bowen.